I freely admit it – I don’t care for musicals. At all. There are a multitude of reasons for this, but it usually comes back to my lack of knowledge and understanding of music. It’s not that I think music is bad, but that I do not care for most of it. Musicals often fall into the same category, as they end up relying more on the musical numbers in the film and not telling a good story. In fact, most musicals I’ve seen are just excuses to sell their catchy tunes. That the story bits and character interactions between are just small bridges to get to the next number. However, perhaps I have watched the wrong musicals. Because if they made more movies like Gene Kelly and Stanley Donen’s “Singin’ In The Rain,” I would not have a problem watching as many musicals as I can get my hands on. 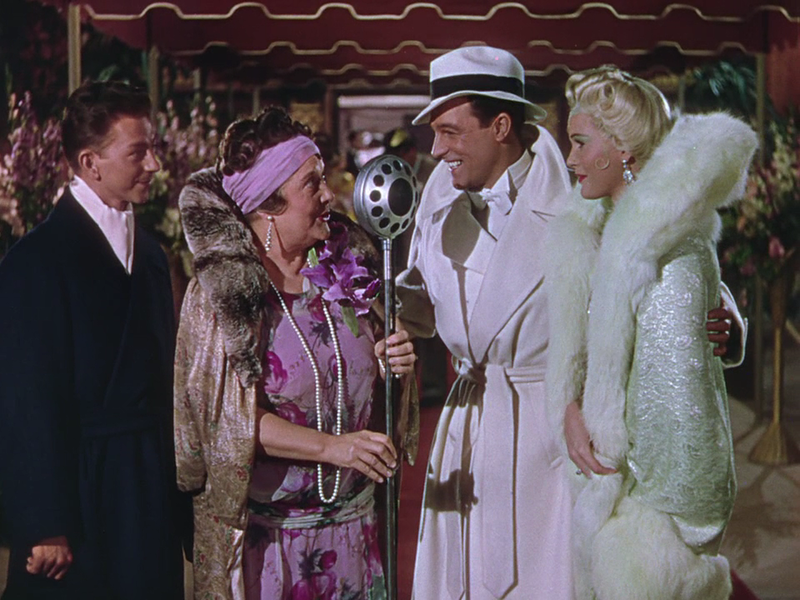 While I may not enjoy most musicals, I make a gigantic exception for “Singin’ In The Rain,” because there is not a single moment in this film that does not make me smile or laugh. From the lavish and colorful musical numbers, to the chemistry between our three main leads, to the abundance of zany and off-the-wall comedy. To say there is never a dull moment in this film would be an understatement. One of the guests calls it a novelty and says it will never take off. Don’s best friend, Cosmo Brown (Donald O’Connor) points out that people said the same thing about the horseless carriage. As demonstrated with “Ed Wood,” I adore movies about the filmmaking process, and “Singin’ In The Rain” covers possibly the best and most damaging era of Hollywood – The end of the silent era and the beginning of talkies. Most filmmakers didn’t know it then, but the invention of sound changed the way that films would be created. Before that, everybody had to act with their eyes and expressions, despite the lack of connection with the audience. Now that sound began to trickle into people’s ears, that barrier between film fiction and reality seemed a bit thinner. “Singin’ In The Rain” chooses to take a more romanticized look at this era, with optimism and hope towards the future. That this is better for filmmaking and will end up giving audiences pictures that they can enjoy and want more of. One point that is stressed early on is that many of Lockwood’s silent pictures move, act and feel the same. That if you had seen one, you’d seen them all. But Lockwood uses this to his advantage when sound comes around and puts all of his talents to use. Which leads me to what I love the most about “Singin’ In The Rain,” Gene Kelley. There are many superb talents out there that can claim they are the triple threat, able to act, sing and dance. If this film is any indication, Gene Kelly blows all of those actors out of the water. In acting, he is charismatic, full of joy and wishes to spread that happiness to everyone around him. When singing, his voice glides through the air, smooth but carrying weight behind it, as if it could cut through fog. But Kelly is at his best when dancing, as he puts everything he has into his movements and tap shoes. At some point, I was afraid that his shoes would catch on fire from how elaborate and lightning fast his feet moved. Gene Kelly put his entire body into this performance, as if every action he made was to awaken Sleeping Beauty so that she could live her happily ever after. 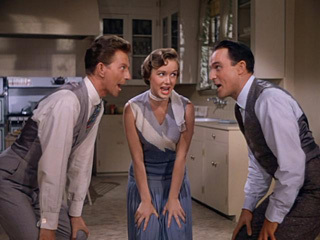 Many sequences in “Singin’ In The Rain” are done in long, uncut takes, which adds to the technique and skill needed to pull of Kelly’s dance numbers. Several shots last more than a minute of Kelly dancing in a rainstorm or jumping off couches. Adding O’Connor to the film was a much needed breath of relief and gives the film its best comedy. His “Make ’em Laugh” sequence is many extended takes of visual slap stick, which includes getting hit in the head with a big piece of wood, slamming into a brick wall, doing several running kung-fu-like jumps off set pieces, and spinning in a circle on the ground while laughing hysterically. And all while singing about how he is in show business to entertain people, and that the best way to do that is through laughter. Even when “Singin’ In The Rain” isn’t enthralling us with elaborate musical numbers, the comedy never ceases to give me a good belly laugh. For example, Lina Lamont is happily absorbed in her own little show-biz world, where Don loves her (he would rather kiss a tarantula), she has power over how her pictures turn out (the director can’t even keep the record on pace with the film) and everyone loves her in everything she does, including talkies. It is too bad that she has the voice of Minnie Mouse on helium combine with cat claws on a chalkboard. Even after going through speech treatment, she can’t pronounce the simplest line without sounding like the windows will shatter at any moment. Poor Jean Hagen. That voice had to be murder on her throat, because she was murdering her own movie when she talked. Here is an impressive tid-bit about “Singin’ In The Rain” – Aside from one song, every musical number in the film was taken from a different MGM musical from the past, including the title song. All of these now famous pieces of music were not created for this film, but were merely incorporated to create one coherent musical. The only number that was made for “Singin’ In The Rain”? “Moses Supposes,” the song that Gene Kelly and Donald O’Connor sing during speech treatment. This adds another level of appreciate to “Singin’ In The Rain.” Sometimes it is more difficult to take an existing song and find a way to work it into the movie than it is to make a new song that can be custom-made for the film. It makes “Singin’ In The Rain” not only appreciate the 1920s, but also the many musicals that created these catchy tunes. “Singin’ In The Rain” is the only musical I can say that I truly adore. The film exudes cheer and enthusiasm for cinema. The musical numbers are lively and brightly-colored, the comedy never ceases with Donald O’Connor and Jean Hagen, the story of 1920s Hollywood is portrayed in an optimistic and heart-warming way, and Gene Kelly is something that everyone needs to see to believe. This is one that never fails to be fun and joyous. I ADORE “Singin’ in the Rain”! One of my all-time favorites too. I, however, am a lover of musicals. I was so excited when my kids were old enough to start watching it too and they became smitten. 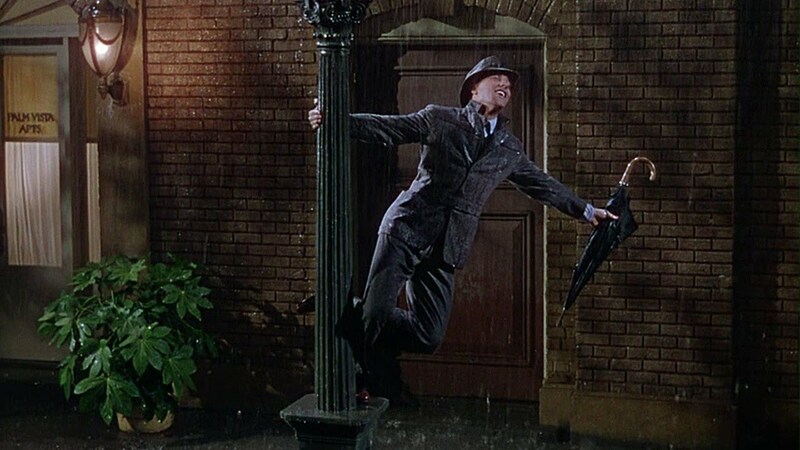 Gene Kelly is a genius and never more so than in this movie. Our favorite sequence is also ‘Make ’em laugh”. The choreography in that is just sublime. I did not know that the songs were cannibalised from other films. Thanks for that tidbit.